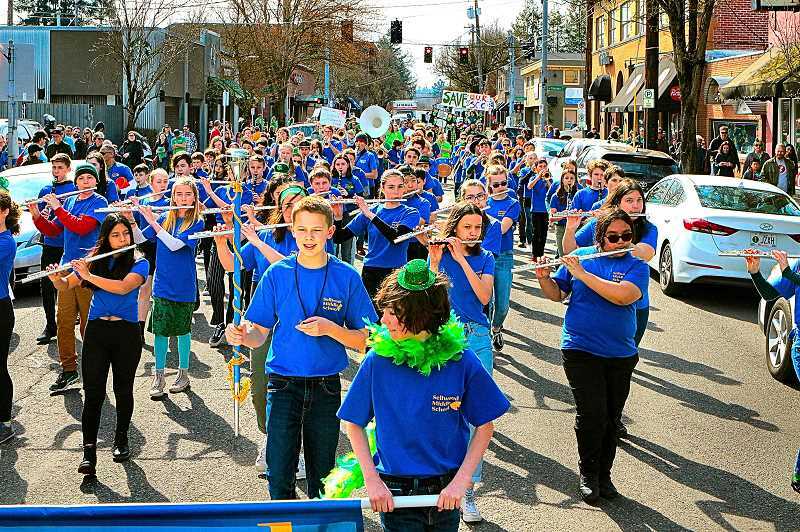 St. Patrick's Day goes on in Sellwood, rain or shine. For a change this year -- it was shine! After several straight years of rainy and windy weather at the annual celebration, the 2019 edition – their 21st Annual – of St. Agatha Catholic School's "St. Patrick's Day Parade and Festival" took place this year under sunny skies, only seven days after freezing weather and light snow! "This is my fifth parade, and it's the first year where we've actually had gorgeous, beautiful weather; we're very excited that God is smiling down on us today," cheerily greeted the school's Principal, Chris Harris. "As a school and church family, this event is all about building community," Harris continued. "Hundreds of volunteers work countless hours to put this together for all to enjoy, with the help of our community member partners to make a great celebration here in Sellwood." Festival organizer Kurt Krasneski agreed, "We're grateful to be in the middle of the Sellwood-Westmoreland neighborhood; we can't think of a better way than this to put on a celebration, and invite everyone to attend." While kids tried their hands at new carnival games, perennial Chef Brian Quinn was in the kitchen, preparing lots of traditional Irish delicacies – including 600 sausage rolls, 200 shepherd's pies, 250 sausages, and 100 corned beef sandwiches. "We've added more food carts this year," Krasneski remarked, pointing to the patrons lined up, "and Ireland's famous Guinness beer is on tap in the beer garden." Eight acts on the main entertainment stage kept the afternoon lively; there were three competitive Irish dance groups on the performance list this year. "It's so wonderful seeing neighbors come by; it's an event that's long been in our parish's DNA and it's our way of giving back to our community," said Krasneski.